Desk-mountable; Pole length: 19.69". Longer pole options available. Supports three LCD monitors, at the same or different heights, 2 with triple-arm, 1 armless. May lift LCD screens to suitable heights for supreme ergonomic comfort. The unique 360° arm swiveling feature allows users to share screen with their close neighbour or the one across the desk, making this perfect for selling and training environments. 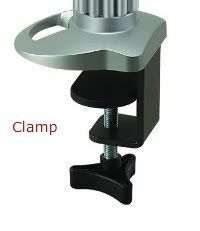 Our state of the art Triple Monitor Desk Mount DM-T1A3 is a completely full motion LCD monitor mount with weight capacity of 22lbs (10kgs) (for each monitor). The Triple Arms featuring -/+ 30 degree tilt, 360 degree monitor rotation, 360 degree swivel & 29.5 inch full extension (for each monitor). 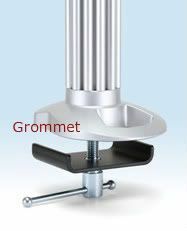 The armless portion is full motion with -/+15 degree tilt, 180 degree monitor rotation and 180 degree swivel. It is ideal for classrooms, offices, public area, industrial settings, production line and many more. This multiple display desk mount renders maneuverability, flexibility and a chic look that is sure to flatter your LCD monitor. 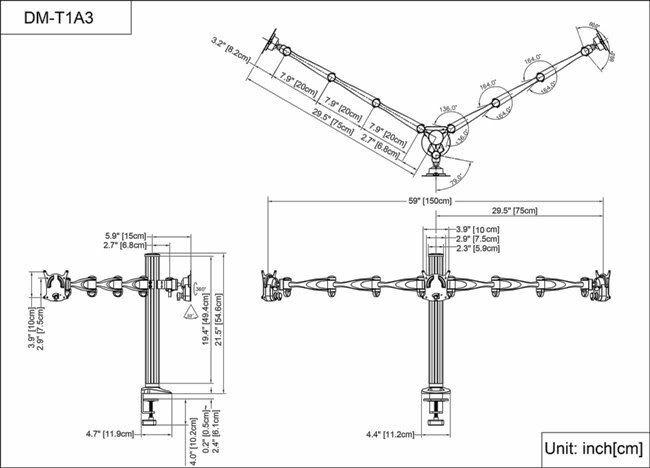 The mounting bracket boasts integrated strength through the latest engineering technology, and is tested for durability in our offshore manufacturing plant. The Cotytech triple monitor desk mount has been built with the end user in mind, and features easy installation while offering intuitive, practical & functional design from one of the leading manufacturers of desk mounts.